Envision is a 501(c)(3) non-profit organization and a contract agency to provide disability services for children and adults with developmental disabilities in Hamilton, Clermont, Butler and Warren counties in Southwest Ohio. Envision serves more than 600 children and adults each year through four primary programs that address a range of conditions and disabilities including: physical or cognitive disabilities, syndromes associated with intellectual disabilities, autism spectrum, learning disabilities, and co-occurring mental health issues. Many have inappropriate behaviors, communication challenges, medical issues, and physical limitations. Each has their unique strengths, gifts, interests, and support systems. Envision’s mission is to support a full and vibrant future for people with disabilities. We envision a vibrant future for people with disabilities. They begin life in nurturing and supportive family settings where they experience love and belonging. They learn skills that help them thrive at home, in school, and in the community. They grow into adulthood to enjoy full and meaningful lives – with a good home, meaningful relationships, and ample opportunity to belong and contribute to community life. An active Board of Trustees leads Envision’s advancement. A number of our Board members derive their passion for our vision and mission from their own life experiences supporting family members with disabilities. We recognize that each person has strengths and help the people we serve discover and build upon those strengths to create a meaningful life. As a trauma-informed agency, we embrace the seven commitments of the Sanctuary® model: non-violence, emotional intelligence, democracy, social learning, open communication, social responsibility, and growth and change. Our communities are better when all people are included. When people belong, they have opportunities to make contributions and be valued for their gifts. Relationships are the foundation for growth and change. We nurture relationships that bring out the best in each person. 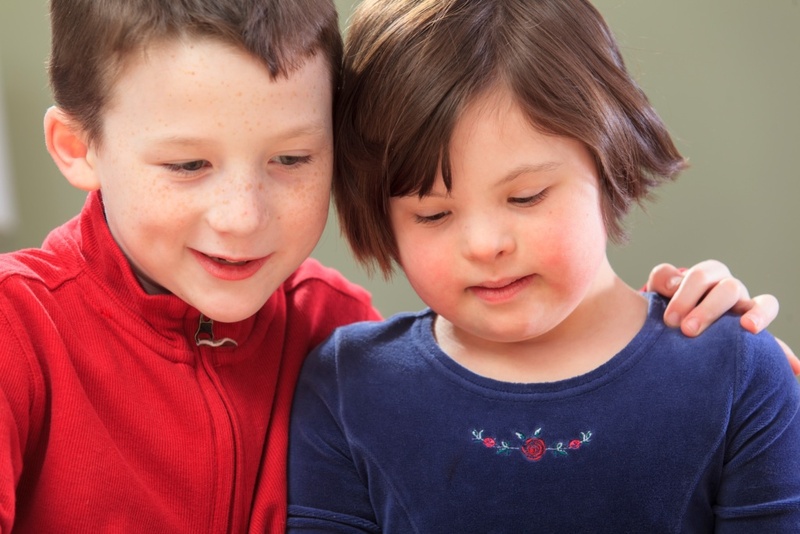 We value relationships between community citizens and people with disabilities. Excellence is the standard for all that we do. We continuously learn new ways to make our services better. We are committed to innovation. Our organization was created in 1963 out of the sheer guts and passion of a small group of families determined to start a school for their children. They rejected the advice of their physicians to send their infants away to institutions. Bringing them home, they faced a world without services, supports, funding, or examples of what might be possible. A strong group of committed founding families spearheaded early battles and helped keep the dreams alive. They devoted their lives to gathering other parents who shared the same dream of building a school for their children. They spoke to community groups. They faced a lot of opposition from well meaning experts and parents, but persevered. Together, they held bake sales, opened small thrift shops, and asked for businesses to help. In 1963, John F. Kennedy signed the Mental Retardation and Community Mental Health Centers Construction Act into law providing federal funding for community mental health and mental retardation centers in the United States. Our founding families managed to raise enough funds to provide the match money for one of these first grants awarded in the state of Ohio. They raced against time to raise the needed funds and created their rally cry – we are on the threshold. Threshold continues today as the name of our semi-annual newsletter about the milestones and wonderful stories about those whose lives have been touched by our organization. Over the years, new legislation was enacted and funding evolved as our country embraced more options for people with disabilities. Our organization continued to change with the times: closing the original school as mainstream education became best practice; opening group homes; bringing supports, training and consultation into the home of families and schools; developing specialized programs for those with co-occurring mental health issues. We’ve evolved beyond the founding vision of a resident home and school. In 2013, in celebration of our 50th anniversary, we changed our name to Envision. This new name acknowledges just how much has changed in our world over the past 50 years. But at the same time, it retains the passion of our founders for stretching into the future and staying on the forefront of what can emerge to expand and enrich the lives of those we serve.